For starters, Reign will announce all our EYSA clubs at the beginning of the match. Players and coaches are encouraged to wear their club kits and show off their club colors. Make a statement by bringing banners and signs to show your EYSA club spirit and support Seattle Reign. The Seattle-Houston match-up promises to be an exciting one. Coming off their National Women's Soccer League (NWSL) shield win and disappointing 2-1 home loss in the 2014 league finals, Seattle Reign FC is looking for redemption in 2015. So far, they're off to a solid start with a 4-2-1 record. By the August 12th match, a full month after the Women's World Cup winds down, and assuming everyone's healthy, US Women's National Team players Hope Solo and Megan Rapinoe should be availabe for Seattle; Carli Lloyd and Meghan Klingenberg should be available for Houston. As if that wasn't enough excitement for one evening, EYSA gets to choose ten players for a little 5v5 bubble soccer action at halftime. Haven't seen bubble soccer? You're in for a treat: part soccer, part bumper cars, all fun. Check this out. 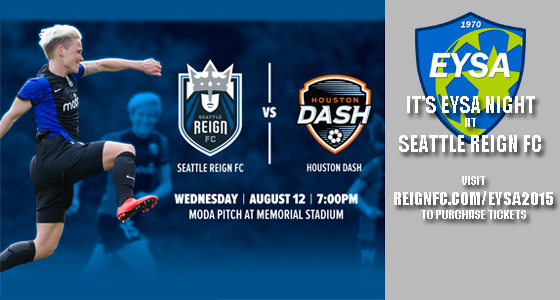 In addition, EYSA players who come to the game in uniform will be able to participate in a special autograph session with Seattle Reign players after the match. And, of course, one lucky EYSA team will have the best seats in the house as ball boys/girls on the sidelines. In short, the evening promises to be a fun family outing and potential team-bonding event. Stay tuned as EYSA will announce details in the coming weeks on how to win a chance to join in on halftime bubble soccer madness. EYSA is a strong supporter of NWSL soccer, and at least three NWSL players hail from Eastside Youth Soccer. Kate Deines signed with Reign FC during its inaugural season in 2013. In 2014, Sydney Leroux joined the roster. Deines has since retired, and LeRoux was traded to Western New York Flash. Also, Katherine Reynolds played with Western New York Flash the league's first two years, and is now a defender for Washington Spirit. Deines, Leroux and Reynolds all played for Eastside FC the premier soccer arm of EYSA. All three have also played at various levels of US national team soccer.